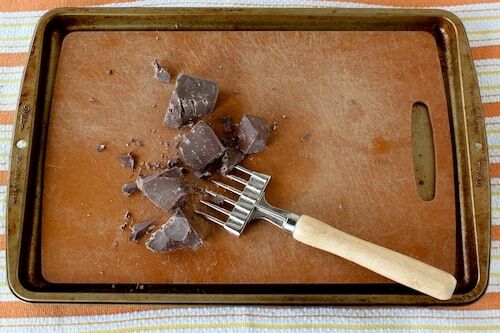 How to Chop Chocolate | Good. Food. Stories. It’s well-established that I’m a snob. 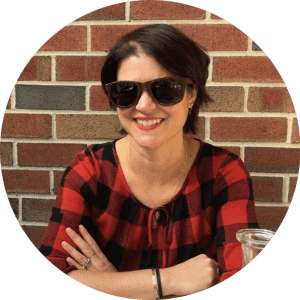 I’ll stand for hours in expensive heels, splurge on the real leather bag instead of the Target knockoff, and buy my cats the Lexus of automatic feeders so they’ll be able to eat in style at any time of day. So it stands to reason that when I’m liquefying chocolate for a recipe, I’m breaking it down from a big hunk of the good stuff: Scharffen Berger, Callebaut, Valrhona, Guittard, and Ghirardelli. Why don’t I just turn to chocolate chips when melting down chocolate for recipes? Because they’re formulated to retain their shape when melted, they have a lower percentage of cocoa butter than a normal baking block of chocolate (David Lebovitz calls this kind of chocolate “baking resistant chocolate”), so their melted texture can be grainy, uneven, and downright iffy. When enrobing homemade Tastykakes or Mallomars, or adding melted chocolate to Oreo cookie dough, I want everything to be smooth sailing. Like the Skeksis smashing away at the Trial Stone in The Dark Crystal, I used to attack my chocolate blocks with my big chef’s knife, but feared losing a finger every time my knife skidded across the surface. Suggestions to use my serrated bread knife instead just left me with chocolate dust. And another professional recommendation—”just wrap the block in plastic and drop it on the floor!”—obviously didn’t go over so well. I tried and tried to resist, but it was time to call in the uni-tasker. 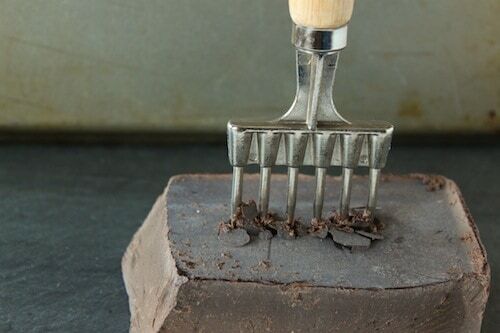 A chocolate chipper—a $5 piece of equipment that looks like a tiny pitchfork—is a small investment that pays off in spades, keeping fingers intact and breaking down huge blocks of chocolate like a champ. 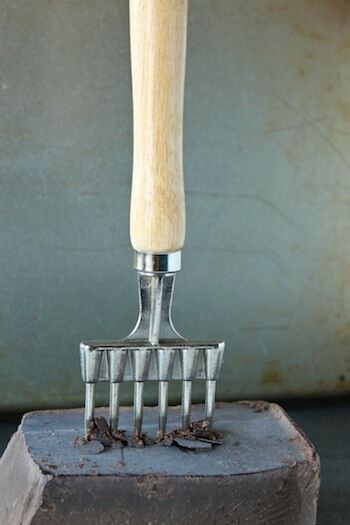 Its prongs aren’t razor sharp, so you’re safe from split-second skids and scares, and makes the work of getting high quality chocolate into meltable chunks much less of an onerous task. Convinced that chopping chocolate may not kill you after all? Here are a few things to remember. First, the higher the percentage of cocoa butter and milk solids in the chocolate, the easier it’ll be to chop—thus, a block of milk chocolate with a 35 percent cacao content will feel more buttery than a block of unsweetened chocolate, which will be hard as a rock and require lots of upper arm strength to get through. So you’re going to need a strategy in play to keep chocolate shrapnel from shooting across the room. This is mine: place a rimmed baking sheet on a damp towel and then place your cutting board fully inside the baking sheet. The towel keeps the setup in place, and the baking sheet keeps the chocolate on the cutting board instead of skidding across the counter. I’m a bit of a rebel in that I typically melt my chocolate directly in a saucepan over low heat, but I’d advise against this if you’re not using high-quality clad stainless cookware like All-Clad. The aluminum discount pan is not the right tool for the job in this case. You can always make a DIY double burner by placing a stainless steel bowl over a small pan of simmering water, making sure the bottom of the pan doesn’t touch the surface of the water, if you’re nervous or melting large quantities of chocolate. Protect your chocolate from a last-minute burn by taking it off heat once it’s nearly melted and stir constantly to get it all the way there. The residual heat will carry through. If if the chocolate’s still too thick to use for dipping, adding butter, vegetable oil, or coconut oil to melted chocolate is a natural way to loosen its consistency. Now the only question that remains is how you want to use that melted chocolate.